Sherry O'Neal outside on Centennial Campus. Photo by Thomas Crocker. A communicator, collaborator and a cheerleader — all words to describe Sherry O’Neal. 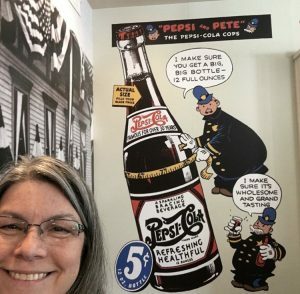 Sherry visiting the Birthplace of Pepsi in New Bern, N.C.
A communicator by trade and a cheerleader by nature, O’Neal brings her passion for sharing stories and encouraging others to her role at DELTA. O’Neal has seen her life come full circle. Each aspect of the things she’s learned over the years always seems to find its way back later in life. Before joining DELTA as its communication coordinator in 2015, O’Neal was no stranger to NC State or higher education communications. Aside from being an alumna of NC State, O’Neal’s first job was at the then-named School of Textiles where she wrote press releases, organized conferences, wrote and printed brochures and more. She also held the director of communications position at the College of Design for more than six years. O’Neal grew up in the Raleigh area and has lived 30 miles from here her whole life. When she was in the 7th grade, she attended a cheerleading camp at Peace College which led to a love for the school where she would eventually receive an associate of arts degree and end up being their director of college relations. In this role, O’Neal was involved with Peace College’s change from a two- to four-year college. She was instrumental in changing the way people saw Peace. She learned the importance of buy-in and input as well as portraying Peace’s students as they were — in ponytails and sweatpants. The circle continued to round as she made her way to the community college system office as their first director of internal communications. O’Neal happened to have completed her thesis on internal communications at the community college system while earning her master’s in communication studies at UNC. After this, O’Neal started teaching at Peace, NC State and Wake Tech before joining DELTA. “It seems like everything I’ve done has paved the way for whatever direction I’m going in, and it ends up making a connection,” O’Neal said. How would you describe your position at DELTA? What’s your day to day like? “I have a goal of getting the word out about DELTA to make people here realize that no matter what their role is, they’re important,” O’Neal said. With strengths in organizational and internal communications, O’Neal thrives on sharing and collaborating with others inside DELTA and within the university. O’Neal lends copywriting expertise for marketing materials for online and distance education programs, shares ownership of the DELTA website and helps with overall writing, brand and tone. What has been one of your favorite projects? Favorite experiences at DELTA? “One of the things I’m most proud of is the Inside DELTA features,” said O’Neal. 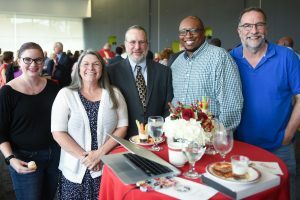 She explained that when many DELTA staff members were moving from various locations across campus into the Center for Technology and Innovation (CTI), she wanted a way for everyone to get to know each other. The first feature was in February 2017, shortly after CTI opened. Another enjoyable project was starting the DELTA Connections newsletter in January 2018 with Jennafer Pettit and Cassidy Colson. “It’s an opportunity to cross promote everything DELTA does to expand our audiences to what we do as a whole unit,” she said. In 2015-2016, O’Neal worked to redo the DELTA Annual Report and put it in WordPress for the first time. Part of this included adding a staff accolades page which recognizes DELTA staff members’ achievements, presentations, etc. “It was important for people to see they are valued for doing the things they are doing,” O’Neal said. The staff accolades also shows people within the university about DELTA’s expertise and outreach activities. The reorganized annual report was well received and even asked to be duplicated by another college. O’Neal loves working on teams where she can brainstorm communication channels and goals, and put the theory she’s learned over the years into practice. O’Neal values the collaboration at DELTA and getting to work with so many different teams. “I really enjoy the people at DELTA, it really does feel like a family,” she added. Sherry and her family at her son David’s wedding. 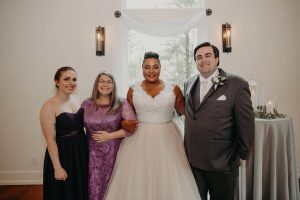 Left to right: Sherry’s daughter, Sarah, her daughter-in-law, Victoria, and son, David. A large part of O’Neal’s life is centered around her family, friends and dog, Sadie — with many other activities sprinkled in. To keep up with her friends and family, O’Neal enjoys writing and mailing letters. “I love going to get Hallmark cards and writing letters,” she said. She writes to her aunt who is in her early 90s as well as her daughter, Sarah, who lives in Pittsburgh. “I’m really excited to get my new stamps — the scratch and sniff popsicle stamps. I’m going to send Sarah every flavor,” she laughed. Connecting with others is at the core of O’Neal’s activities inside and outside of work. Sherry’s dog, Sadie, at the beach. During her senior year at Garner High School, O’Neal was elected projects director by her senior class. Every five years, O’Neal is charged with organizing her high school class reunion, a job she has seen her dad do for many years, so she knew as soon as she took it on, that it would be for life. Of course, she has a team of classmates who rally around to help plan and execute each event. In addition to the reunions, O’Neal is part of the group who organizes sending flowers or donations to classmates who have passed away. “We’re one of the only classes that I know of that has a flower fund,” she added. 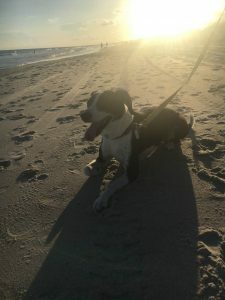 O’Neal also loves going to the beach to hear the waves as well as taking her dog on walks. O’Neal has also been involved in numerous professional communication organizations over the years including the College News Association of the Carolinas (CNAC) and the Raleigh Public Relations Society (RPRS). In 2002, she won the Watt Huntley Award for Lifetime Achievement in Public Relations from RPRS. Tell us more about your involvement with the College News Association of the Carolinas (CNAC)? “I got involved in CNAC in 1994 when I was the director of college relations at Peace College,” O’Neal said. She’s held positions such as secretary, president and board member over the years. Early on in 1996, O’Neal won the Ken Sanford Award for an outstanding new member who has contributed a great deal to the organization. 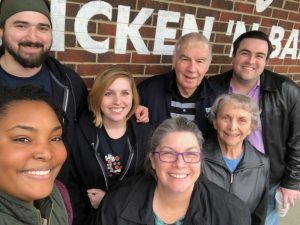 She and a team of colleagues helped the officers by hosting the annual conference at Peace College and organizing a progressive dinner — appetizers at Peace, salads at NC State, BBQ at Duke, and ice cream on Franklin Street at UNC. In 2018, O’Neal received the H. Lewis Gaston Award for outstanding service to the association and accomplishments in public relations for higher education. In between the awards, O’Neal has designed brochures for CNAC’s annual conference and been a general advocate for the group by recruiting new members. At CNAC’s 2019 conference, O’Neal gave a presentation on internal communications with NC State’s Internal Communications Lead Suzanne Stanard. “[In my career] I’ve relied on my professional colleagues, so that’s why CNAC means a lot to me,” she said. 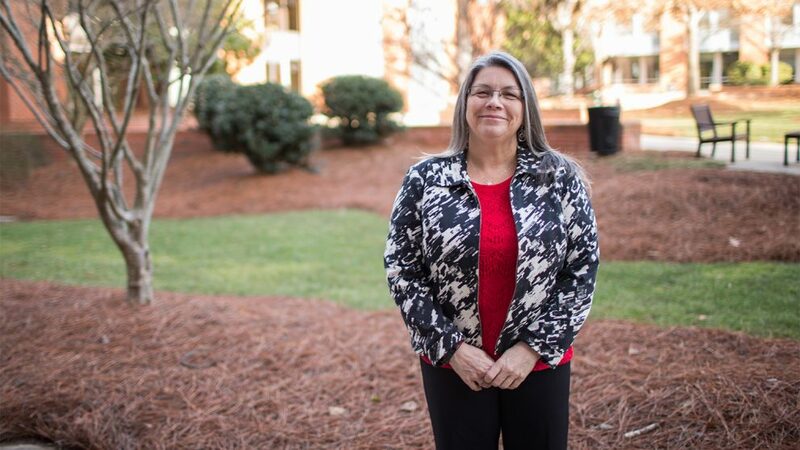 Whether she’s connecting with colleagues at CNAC or across NC State’s campus, O’Neal’s heart for communication always shines through. Sherry and her family. Back row: Nick (Sarah’s boyfriend), Sarah, J.C. (dad), and David. Front row: Victoria, Sherry and her mom, Colleen. Sherry and other DELTA staff members at the 2018 NC State Awards for Excellence reception. Left to right: Janna Martin, Sherry O’Neal, Jeff Webster, Emanuel Brunson and Marty Dulberg.